SCENAR therapy, as well as COSMODIC therapy and ENS therapy, is unique in many ways. While its main goal is the same as with many other healing modalities (pain relief and improvement of functions), SCENAR-type adaptive electrical stimulators “turn the table” on the body-device relationship letting the body control the treatment process – and that very beneficial in the long run change in the “balance of power” sometimes results in unusual reactions and effects that can be confusing and even scary if you are not prepared. dizziness and light-headedness to the point of fainting. These reactions (all of some of them) may come suddenly “out of nowhere” and surprise you, but there is no reason to worry. That’s quite typical and merely means that your body is waking up and general adaptive reactions are “kicking in”, which is always a very good sign. Just give it a few minutes and everything will settle down. Your improved adaptivity will soon result in more pleasant phenomena, such as the famous “SCENAR effect of 4 Gs”: good appetite, good sleep, good mood, good performance. By giving the body a feedback, mirroring its imperfections and problems, SCENAR (and more so COSMODIC and ENS) increases the body’s awareness. It also gives the body strength to jump-start and accelerate its healing programs and mechanisms. And what is the first thing the wiser and stronger body does stepping on a fast track to health? Yes, it starts cleaning its domain, in other words it begins DETOXING. Detox reactions come in many forms and may be quite unpleasant and downright frightening, if quickly and strongly triggered. Not all of these reactions are unique to SCENAR/COSMODIC; some are common for all holistic practices, just may be more intense with SCENAR therapy. For example, the typical Herxheimer reaction may hit you like flu: with general malaise, fatigue, headache, nausea, pain in muscles and joints, and even fever. You may have a bad breath, itchy skin, runny nose, cough out a lot of phlegm, urinate frequently, and have diarrhoea. You may be sweating a lot and generally stink. You may even notice passing out some sand with your urine or, if you have heavy metal toxicity, have metallic taste in your mouth. These are all ways of your body to get rid of toxins. The Herxheimer reaction usually lasts no longer than 3 days, but sometimes may go for as long as a week. If you are experiencing it, drink plenty of water or herbal tea (the more the better) and work with your SCENAR/COSMODIC on elimination organs to help them function more efficiently (liver, gallbladder, intestines, kidneys, lungs). (NOTE: the Herxheimer reaction is often called “a healing crisis” in popular literature and on the web. In SCENAR therapy, however, “the healing crisis” has a different meaning (CLICK HERE for details). We usually apply this term to the expected aggravation of symptoms of chronic disorders, whatever the symptoms are, during the course of SCENAR therapy following the principle “it has to get worse before it gets better”. It really does, but it does not have to be too bad, especially with COSMODIC and ENS). There are also some reactions that are unique to the SCENARs of the second generation and that we still have difficulties explaining. For example, COSMODIC “tattoos” and “craters” – rare and intriguing phenomena. 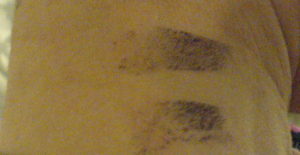 The “tattoos” appear as black lines on the skin directly under the silver COSMODIC electrodes (almost like the electrode imprint), if the device is left for a long time on the same area in the projection of a toxic organ (see a picture on the right). Some of our clients report getting these lines if they accidentally fall asleep treating themselves. The lines seem to form inside the skin and cannot be wiped out; they usually go away on their own after a period of time. The theory is that the toxins pulled out of the body by the device react with the silver of the electrodes “imprinting” the skin. Toxins can be of a different nature. 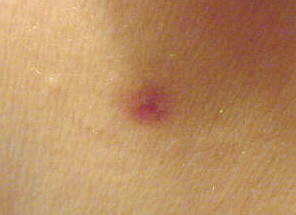 We see “COSMODIC tattoos” often around the thyroid gland, which accumulates radioactive substances. Hence – our standard recommendations to NEVER leave the device on the thyroid; move over it, but do not STAY on it. 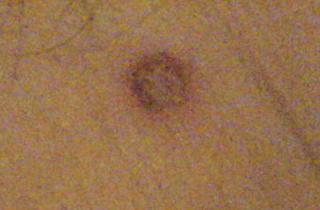 On rare occasions during COSMODIC therapy, when the energy of the area is very incoherent, you may have a sharp energy discharge (feels like a bee sting) and the area develops a bright red dot that looks like a burn. We call it “the SLIDER crater”, because we see it mostly with the EX735Ag; the simpler COSMODIC models seldom produce craters (maybe because they are not powerful enough). “Craters” do not appear on every person, or on the same person all the time. They can also appear anywhere on the body regardless of the COSMODIC positioning. If they show up in the area you are treating they usually refer to a local problem, and if away from the treated area that usually mean a systemic disorder. There is really no way to predict where or when the “craters” will develop, as we do not know much about them. The nature of this phenomenon is quite enigmatic. It has been observed that these marks appear as a result of energy outburst from inside. It is almost like a lightning coming out of the body (in Russia they watched it in a dark room). The speculation is that the EX735 “chases out” of the body some energy formations that disrupt the normal energy flow. These rigid formations cannot be re-structured to be included in the coherent flow of energy in the body and the only way to deal with them is to expel them out. Some gifted healers can do that in alternative energy practices, but it is not easy – and there are no known devices that can facilitate this process… except for the EX735Ag. However unpleasant, these marks are actually a very good sign. Their appearance usually signifies a major positive shift in the disease dynamics, meaning from that moment on you are going to get better quick. “Craters” eventually heal, but may stay for quite awhile slowly fading away. You can keep treating the area in a usual manner; just try not to stay on one spot for too long. It is not unusual to have sudden emotional reactions during SCENAR therapy: start crying and not being able to stop, develop irrational fears (or rather remember them), or become “an emotional wreck”. SCENAR affects all levels of your being, and if you have deeply seeded emotional issues or buried in subconscious painful memories, SCENAR/COSMODIC (and especially ENS) may bring them to the surface so that you can process them and let go. Don’t be afraid or embarrassed of the “rivers of tears”: they will wash away your sorrows and open you up to a lighter and brighter future. They will also provide for a much faster healing of your physical body since so many of ill-health conditions are rooted in your psyche. We welcome these emotional reactions, but we cannot predict them. If you have a COSMODIC with silver electrodes or ENS (or use a SCENAR/COSMODIC device with remote silver electrodes), we highly recommend doing “Emotional Detox” on everyone, and on a regular basis. You never know – this simple procedure may be a key to unlocking a secret to your, your loved one’s, or your client’s rapid healing and/or wellbeing. I hope I did not scare you off by describing what potentially MAY happen during your SCENAR, COSMODIC, or ENS therapy. Anybody can tell you about all the good and encouraging things these modalities will do for you – all true. I just thought you ought to know not only the best (that’s easy), but also the worst-case scenario. Just keep in mind three things while processing the above. This is the WORST that can happen. From our experience, you should not expect any other unpleasant surprises from your SCENAR, COSMODIC, or ENS therapy. The described effects and reactions are rare and chances that it will happen to you are very small. However odd or unpleasant, these effects and reactions in their essence are very beneficial and usually mean that your body is responding to therapy quickly and profoundly – and that you should expect great results soon. Personally, I don’t mind a little discomfort if I know that it works to my benefit and that at the end I will be much better off. Do you? I leave in México. I don’t know how to use the ENS therapy and how it works. Can I have sone information please ? I woul like to see you some day. Thank you for posting this informative article. As a practitioner who uses the Ex735AG, I greatly appreciate these insights. Do you know if scenar and cosmodic is different than the American version, Avazzia Life. I was told its the American Version of the Russian Scenar. Is that true? If not how are they different? Does the scenar have quantum energy or just frequncies? How is it different from a Rife machine? It is our understanding that Avazzia produces several versions of the Tennant Biomodulator, which is to some extent indeed an American version of the first generation Russian SCENAR (or has been inspired by it). On the other hand, COSMODIC devices are unique to LET Medical Research Laboratory in Russia and no other manufacturer produces similar devices. We are not sure what you mean with “quantum energy”, but all SCENAR-type devices work with ever-changing electrical impulses, similar to the human nervous system.